Today finally sees the release of the much-anticipated The Beatles: Rock Band from Harmonix and MTV Games. The latest installment in the popular Rock Band music game series lets you and up to three friends re-live the career of the Fab Four from Liverpool right in your living room! Does The Beatles: Rock Band let you play the "John has a girlfriend" concert? Does a digital avatar of Yoko appear onscreen and break up the band all over again? 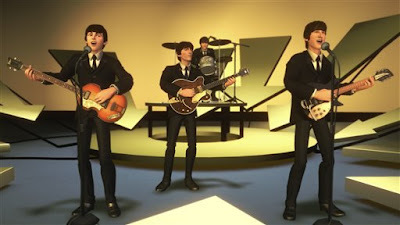 Will your game data get erased when the Beatles go their separate ways? I guess this is great for gamers but as a musician I have to say that the idea of people pushing little buttons to simulate performing those great songs makes my skin crawl. Did Paul and the estates of John and George sell the rights or was this from a otherwise acquired catalog? The Beatles: Rock Band was produced with the full blessing of Paul McCartney, Ringo Starr, Yoko Ono and the estate of George Harrison. This is much an official product of Apple Corp. as it is Harmonix and MTV Games. I can understand where you're coming from as a LOT of musicians have conveyed similar thoughts about Rock Band, the Guitar Hero games etc. However as one who is admittedly not a musician, I have gained an interest in learning how to really play guitar, partly as a result of playing Rock Band. Just as I can see how some might want to learn how to fly a real plane from playing Microsoft Flight Simulator. That's cool, it's a musician thing and not an indictment of game playing. I'm glad your interest was piqued. I guess the Boys (and survivors) wanted a little more scratch. When are we going to get Rock Band Weird Al Yankovic?? My life is not complete without digital Jon "Bermuda" Schwartz accompanying on drums!!! !